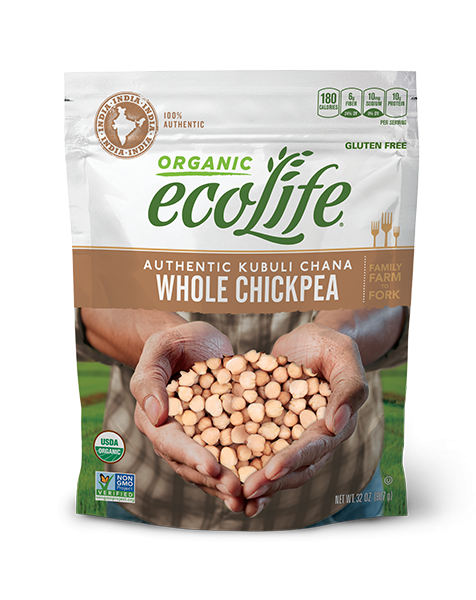 ecoLife® Organic Whole Chickpeas are authentically sourced from India, where they are especially popular in Northern regional cuisines. This versatile legume is delicious in curries, salads, hummus and traditional Indian snacks. Whole Chickpeas makes a nutritious addition to your diet with high levels of fiber and protein, vitamins, and low amounts of fat and cholesterol. Sort, rinse and drain before cooking. For added flavor, add a pinch of salt or other herbs and spices before cooking (optional). To decrease cook time, soak overnight, or 6-8 hours before cooking, and reduce simmer time by half. Combine 1 cup Whole Chickpeas and 3 cups water in a saucepan. Bring to a boil. Reduce heat to a simmer (medium-low to medium), cover and cook for 75-90 minutes. Add more water if necessary to keep the Whole Chickpeas submerged. When done, Whole Chickpeas  should be tender and soft. Combine 1 cup Whole Chickpeas and 3 cups water. Never fill cooker more than half full. Bring to pressure on high heat. Reduce heat to low, but keep under full pressure and cook for 20 minutes.